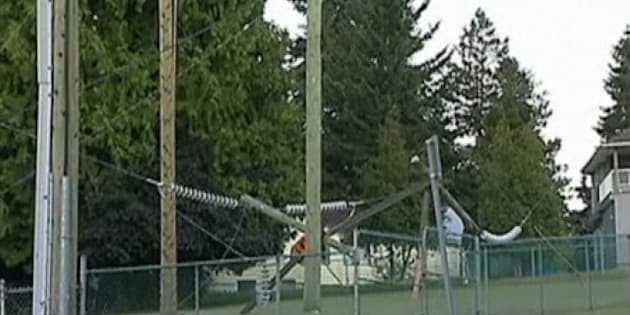 CBC — A hydro transmission tower in Surrey, B.C., collapsed Monday night, leading to a major power outage and highway closure expected to last 24 hours. A second tower farther inland collapsed from the tension created when the first tower toppled as a result of erosion caused by high water levels. Highway 1 and the Port Mann Bridge are closed in both directions, and about 25,000 people were initially without of power. BC Hydro said it is working to restore power to a remaining 4,000 customers. The tower collapse sent high-voltage wires into the river and onto roads and snapped hydro poles. The surrounding area was closed to traffic because of the potential risk. David Lebeter, vice-president of field operations and safety with BC Hydro, said high water levels on the Fraser River eroded the soil surrounding the tower. Lebeter said BC Hydro had been aware of erosion around one tower and crews made temporary repairs. That tower remains standing, but it was a tower downstream that collapsed. "We became aware of a problem with that earlier [Monday], and the situation developed very quickly," Lebeter said. The collapsed tower pulled down another tower inland on the other side of the CN rail yards, the Vancouver Province reported. Lebeter said the power cables were deactivated instantly and there are no safety issues. RCMP in Surrey and Coquitlam, however, shut down Highway 1 and the coast guard halted river traffic for safety reasons. Sgt. Peter Thiessen said "steps have been taken to close down the Port Mann Bridge based on the extent of the downed wires that cross over the Fraser River and over into Coquitlam. Thiessen said no injuries have been reported and it's unclear when the roadways and waterways will reopen. Highway 1 is the main connector between Vancouver and the eastern suburbs, and DriveBC advised at about 10:20 p.m. Monday that the closure at the Cape Horn interchange would likely continue for 24 hours. An eastbound detour is available via Brunelle Avenue to the Pattullo Bridge. A westbound detour is available via 160th Street to the Pattullo Bridge. BC Hydro crews were working throughout the night at the scene.